The movie will feature a largely black cast, including 12 Years a Slave's Chiwetel Ejiofor as villain Scar (originally voiced by Jeremy Irons), Alfre Woodard as Simba's mother, Sarabi (originally voiced by Madge Sinclair), Florence Kasumba as hyena Shenzi (originally voiced by Whoopi Goldberg), very different lion movie The Ghost and the Darkness' John Kani as baboon wise man Rafiki, with JD McCrary and Shahadi Wright Joseph as the younger versions of Simba and Nala (originally voiced by Jonathan Taylor Thomas and Niketa Calame, with Matthew Broderick and Moira Kelly as the character's adult voices). Additionally, James Earl Jones, the voice of Darth Vader, will reprise his role as Mufasa, while Eric André and Keegan-Michael Key will be playing Azizi and Kamari, character names that didn't appear in the original (though they may be new names for missing hyenas Banzai and Ed, as placement on the announcement image flanking Shenzi would seem to suggest). Further voices are provided by John Oliver as hornbill majordomo Zazu (originally voiced by Rowan Atkinson), with Billy Eichner and Seth Rogen as the Rosencrantz and Guildenstern to Simba's Hamlet, meerkat Timon and warthog Pumbaa (originally voiced by Nathan Lane and Ernie Sabella). The movie will be directed by Jon Favreau, most famous for being the original director of the Marvel Cinematic Universe,who previously directed the live action remake of The Jungle Book. That movie won Best Visual Effects at the Oscars, thanks to the realistic CG animals used in the movies. In fact, some have pointed out that under the rules of the Oscars, The Jungle Book could have competed as an animated movie; the human character Mowgli was the only live action part of the movie. The Lion King does not have any human characters, which does bring into question exactly how "live action" the "live action" remake will be. The original Lion King was the first Disney animated movie to not be directly adapted from anything, though many have pointed out it seems to have been at least partially inspired by the Japanese animated series Kimba the White Lion mashed up with William Shakespeare's play Hamlet. The movie still holds the box office record for a "traditionally" animated feature film. It inspired two direct to video sequels, The Lion King 2: Simba's Pride and the Rosencrantz and Guildenstern Are Dead to The Lion King's Hamlet, The Lion King 1 1/2, two cartoon series, Timon & Pumbaa and The Lion Guard, a notoriously difficult video game and a Broadway stage play. Though there are multiple live action remakes of Disney animated features scheduled, talking animal movies are not being given priority, though 2019 will also feature Tim Burton's Dumbo. I've seen the trailer for the movie...it's a little meh, but who knows, it might turn out to a good film hopefully! I feel the Jungle Book one did. Anyway, sounds like they're trying to get an African tone to the film with that kind of cast. There are some fake trailers on youtube of it. I don't think a real one is out yet. Well, this is embarrassing. I went back and read the description of the video more closely, it said it was a fan-made trailer and was fake. I should've known. Glad you pointed it out. At least the real one will probably be ten times better than that one hahaha! The fakes look pieced together with mostly footage from the Chronicles of Narnia movie series. The remake must be highly-anticipated for some to put in this amount of effort, though it could be a fun exercise in practicing video editing. Yeah I didn't really watch the ones after the first Chronicles of Narnia so I didn't notice. They probably definitely had their fun in video editing! The stage musical version of The Lion King has some added scenes that weren't in the animated film, which has me wondering if any of this added material will be included in the new film. Well, on one hand, I'm thinking they'd probably add their own song, you know, gotta have something for that Original Song Oscar category. And, you know, you don't hire Beyonce to not have her sing an original song. On the other hand, Favreau didn't seem to be much interested in making a musical with The Jungle Book, so they might even let him cut the songs until the credits completely this time. Maybe have "Can You Feel the Love Tonight" play over the romantic scenes, and Timon and Pumbaa sing "Hakuna Matata" like they sang "The Lion Sleeps Tonight" in the original, and that's about it. I just can't accept Timon and Pumbaa's VAs being replaced. That and Seth Rogan is terrible. So in what way is this going to be live-action? Even your link for that point describes it as "CG-animated re-imagining." I'm guessing they aren't doing it a la broadway live action and I highly doubt they will try a Homeward Bound type of live action, so I'm guessing this "live action" is going to be CGI characters on green screen backgrounds. Or... entirely animated. Since you also comment on that, I do wonder why you chose to describe it as "live action." I'll probably not watch it. Make some new movies. Stop remaking things which are perfectly good as they are. Yeah, it's been a headscratcher. But I think it's Cartoon Research's big list of animated movies that points out, sometimes, it really comes down to marketing. Movies like Avatar or Gravity could probably qualify as an animated movie by Academy standards, but at no point were they marketed as animated movies; likewise, this Lion King remake and The Jungle Book are advertised as live action, even if it is using animation for ninety percent of everything. I guess the big difference is, in the original, there was never really any illusion that the animated characters were not cartoons, while the animation in The Jungle Book and this remake are meant to realistically depict real (if talking) animals. As far as why, the interesting thing about The Jungle Book is that it specifically dealt with problematic issues in the original movie; critics have pointed out that the original cartoon was "conservative" in that Mowgli is not allowed to live in the jungle, and must go live with humans, because that's the way the world works, even if that's not what Mowgli wants. It's anti-integrationist. In the remake, Mowgli is a much stronger character because he rejects the idea that he can't be both a man and a member of the jungle society. He even changes the mind of very conservative Bagheera, who near the end of the movie specifically tells him to "fight like a man" after spending the movie either trying to get him to leave the jungle as a man or act more like a wolf. Mowgli is able to positively effect both his own destiny, as well as the jungle's, unlike the original where his destiny is picked for him and nothing is permanently changed. Likewise, as Poster I Will Not Say By Name Lest He Appears pointed out, there are some very "conservative" themes in the original Lion King, which could also be considered anti-integrationist. The fact that, in this version, Shenzi the hyena will be played by a primarily dramatic actress rather than a comic actress offers me hope that, like Favreau's adaptation of The Jungle Book, these problematic (and admittedly mostly incidental and unintentional) themes will be addressed. Basically, the hyenas in the original movie have legitimate grievances that are not addressed by the movie, and their original mistake is trusting Scar, someone they believe is their friend, to help them address those grievances, which is hardly a moral failing (the moral failings do come, but only later on). This is the point of adaptation; yes, it's an old story, but in the case of The Jungle Book, it's told from a new perspective. We as a society change, so our relationships with old stories change as well. 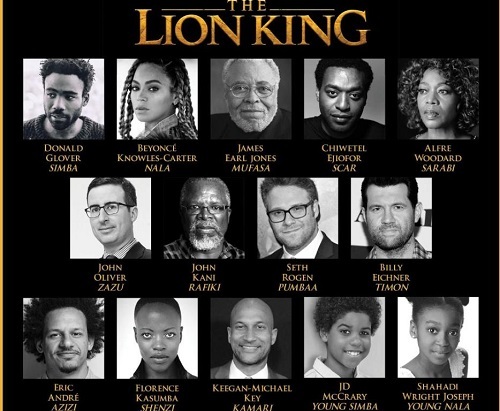 One of my best buds is obsessed with The Lion King, as I'm sure isn't unusual for this fandom, but boy was he absolutely devastated when he saw Beyoncé on the cast sheet. He's afraid they're gonna ruin Nala. I have not much in the way of adaptation concerns, I don't really care much for the movie. But I am certainly gonna give this remake a chance cause of this excellent cast.